Home » Broadband » Econet ventures into advertising? If you’ve made a call on any Econet line in the past couple of days you probably noticed that some of the pop up notifications that you get for any call attempt now come with an advert at the bottom. 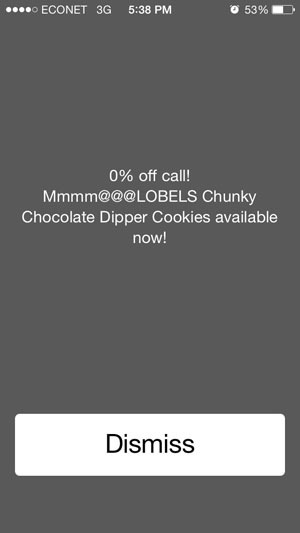 In the case of the call screen captured in this screen shot Lobels, a local baking concern, has a promotional tag for one of its products at the bottom of these notifications. This is something that seems to indicate a new use for space that has been lying idle. This idea, though new for Econet and probably all of local telecoms is hardly a fresh concept. Operators like MTN have been doing this for years, with these notification adverts extending to Call Back Requests (Please Call Me Backs). We haven’t established from Econet how much these adverts cost, what the conditions to sign for the service are, whether or not every subscriber will see these adverts and whether or not this is another pilot project that hasn’t gone mainstream. Whatever the case though this is a great brand visibility concept for any company or product that signs up for the service. With a high mobile penetration rate this is one of the best ways to have an extended market reach, especially for products and brands for example such as Lobels that have a wide target market. For Econet it’s also a smart way to shore up cash opportunities that can help improve that bottom line and offer another revenue stream to somehow compensate for falling voice revenues. We wonder though if this service will be extended to small businesses and startups with affordable or lower rates. This is where regulators must exercise their power!! But hang on, this is Zimba we are talkin about. Who am l kidding!! This has been in beta testing for a while. The system actually goes as far as targeting adds based on location for instance, if you are calling from Borrowdale Village you will get adds from TM borrowdale, Nandos borrowdale etc. Smart but as with all things I want an opt out option. If you do not let me opt out you better subsidize my call and say 50% of your tariff is paid for by TM or something. The discount has nothing to do with the ads, but it has to do with BUDDIE ZONE which was already in existence prior to this new ad service, so please let me just enjoy my Buddie Zone and leave me out of the ads. Interestingly, the screenshot ad shows 0% off call!! You can opt out by disabling broadcast messages. The fact that you turned broadcast messages is enough to tell that you want to receive ads and all. Its like turning on Radio Zimbabwe and then saying I want to hear music chete no Mbare Chimurenga jingles. So turn off broadcast messages and stop telling us about regulators step in and that. go to *137*9# and opt out…..granted you won’t also she how much discount your Buddie Zone is on if do that of course. In other countries like America each service has its own cell broadcast number so maybe news is 001, weather is 002, base station is 050 and so on. Don’t mix useless information with useful information. That said I don’t care for Buddie zone. My net one line has taken care of that. Funnily enough its Telecel that got the boot eventually. Econet is smart. I was thinking about this and I have two things in mind here. 1. Offer me a discount to read a silly advert that I can ignore. Count me in! Effiiciency – according to google 100sms = 5,000,000 CB’s time wise. That is the time it takes to push 100sms’s is 30seconds of network resources. The same 30 seconds can push the 5million cbs. Eventually I guess econet can exploit the OTA upgrades to send new settings to devices. No need for storage on my phone so even if I have blocked 3xxxx from messaging me this will still come through 100% penetration here. well played and thought out. now if you want my buy in as a corporate maybe lets assume Delta or Dairiboard etc. you better have great rates that blow short code messaging out of the water. As a consumer my discount better be 50% or better paid for by the corporate that is advertising. Yes I know I want my cake and I want to eat it too but well this is ZIM!